Senator Chris Murphy believes games can cause violence but admits there isn't enough research to legislate. On December 14th of 2012, Adam Lanza walked into Sandy Hook Elementary and murdered twenty-six people, including twenty children, in addition to his mother whom he had shot earlier in the day. Understandably, people are still wondering why anyone would commit such a horrific crime and while there has been a choir of voices citing a variety of causes, more than a few have pointed to violent videogames as being one of the forces behind Lanza's actions. gave a speech in which he singled out games as one of Lanza's driving forces. Now, Murphy has offered some clarification about his comments. "What we know is that this young man, deeply mentally ill walking the school with an assault weapon armed with 30-round magazines. What we know is that he was very, very severely mentally ill; that his mother had been trying to get him help for years. And what we also know, is that he spent a lot of time playing violent video games," said Murphy. "Now, nobody can sit here for certain and say that without any one of those things, without the powerful weapons, without the mental illness, without the exposure to video games, this wouldn't have happened. We can't put ourselves in his mind. But we do see a trend where some of these shooters do have exposure to these video games." 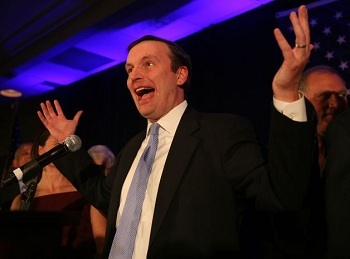 While Murphy does continue to believe games can be a factor behind incidents like the Sandy Hook massacre, he admits that there isn't sufficient research to back any sort of restrictive legislation. "What researchers will tell you, is that if you already have a severe mental illness, and a predilection to violence, perhaps the video game exposure can put you over the edge. But in and of itself, there is no research showing that there's a link," said Murphy. "Before we pass any legislation, which would limit the exposure that people have to these types of video games, I think it's important that we have the research and the data and that's what we're trying to do right now."